Growing up in Longview, Tex., in the 1990s, Brandon Maxwell used to go to the local beauty supply store and the Goodwill, buy cheap hair extensions and secondhand dresses with which to style his girlfriends, and then photograph them around town with disposable cameras from CVS. Studying photography at St. Edward’s University in Austin, Mr. Maxwell kept up the Steven Meisel-on-a-budget routine, only his fellow students were all into fine art and were very serious.“Here I was asking my girlfriends to be in a field with big hair and a fur coat, screaming, ‘Jump!’ ” Mr. Maxwell said. “I would completely ignore the camera unless somebody handed it to me. I’d be so lost interacting with the girl.”It didn’t make him a photographer in the end, but it was good training for his current job as Lady Gaga’s stylist, one of the plum gigs in fashion. Lady Gaga herself agrees, to a point. “To say he’s good at being elegant but he’s not good at being rebellious would be a lie,” she said. “He’s very good at being rebellious. We’ve done pounds of dreadlocks, and things that require wire.”Mr. Maxwell is quick to defer credit, calling his relationship with Lady Gaga a “creative partnership.” He is not the type to dictate what dress to wear, he said. That style will be on display Monday, when Mr. Maxwell shows his new women’s wear line during New York Fashion Week at the uptown Mr. Chow.Despite having no formal design training, Mr. Maxwell said his years spent creating outfits for Lady Gaga have been a mini couture school. If he can stitch together flank steaks backstage at the V.M.A.’s, how hard is it to construct a plunging V-neck?Talking about his debut collection, Mr. Maxwell said the clothes would reflect his love of “powerful silhouettes, powerful women” and classic elegance. Chic suits. Waist-hugging jackets made of horsehair. A palette of black, white and blush. Riff’s has since closed, but it lives on in Mr. Maxwell’s notion of offering women value and a wardrobe that can be worn throughout the day, to work and later to the cocktail party. “I want to make clothes that are almost a uniform for women and that last for years, that are timeless and classic and that are worth their money,” Mr. Maxwell said.Inez van Lamsweerde, the fashion photographer, who met and became friends with Mr. Maxwell on the set of a Lady Gaga video, said his practicality reflects his experience.“Because he’s seen Gaga on stage, he realizes people need to move in the clothes, be comfortable to a level where you can function, sit down, raise an arm,” Ms. van Lamsweerde said.In his own style, Mr. Maxwell is neither outrageous nor classically elegant. He usually wears a casual uniform of pants (Acne), a white or gray T-shirt (James Perse) and sneakers (Nike). Barely out of his 20s, his hair has gone salt and pepper, a result, perhaps, of five years in the fashion fast lane. “My life changed so quickly when I started working with Nicola,” Mr. Maxwell said, referring to the constant travel for styling jobs and the high-profile, all-consuming tours and award shows with Lady Gaga.On a recent afternoon, Mr. Maxwell was in his small studio in Midtown Manhattan with two assistants, working on last-minute adjustments to his collection before he was to hop onto a plane to Los Angeles to style a shoot for Elle magazine. He would return on a red-eye and go right back to work here.“I’ll make time for both careers,” Mr. Maxwell said. 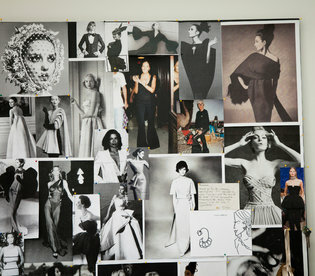 “I don’t sleep much, and I kind of like it that way.”Studying the mood boards and the sample dresses in muslin hanging from a rack, a visitor tried to spot a trace of the big-time-pop-star world that Mr. Maxwell inhabits. It could be found in a pair of flared pants made of alligator skin that looked very ’70s rock star. But, once again, the inspiration was not Lady Gaga but Longview.